Many thanks to Alice Bonasio for the permission to link to below piece she wrote for CIO and crosspost it here. The fundamental question we should be asking children as they grow up is no longer what they want to “be” but rather what they would like to “do.” What problems are they passionate about solving, and what are the skills that will enable them to achieve their goals. Traditional education models are at odds with this type of thinking, however, as they are still built largely around the mythology of finite goals. The concept that there are clear milestones and an eventual finishing line to learning was never ideal, but it is even more woefully inadequate in a technology-enabled world. To thrive in volatile environments, we must embrace life-long learning. One solution that educators are deploying to bridge that gap between traditional learning delivery systems and newer workflows and expectations, is the use of gamified learning platforms. Gamified learning is very helpful in cultivating a mindset where problem-solving becomes a fun activity, and failure is seen as a stepping stone. If, like myself, you’re old enough to have earned your gaming chops alongside Mario or Sonic, you’re unlikely to recall exactly how many times you “died” along the way, or exactly how you adapted your strategy incrementally after each setback. The moments when you beat that boss and rescue the princess, however, tend to stick with you. Vice President of Education at Microsoft Anthony Salcito spoke with me during this week’s Education Exchange conference (E2 in Paris, which brought together a diverse group of educators from all over the world to discuss how best to leverage technology such as Minecraft to deliver better learning outcomes for students. 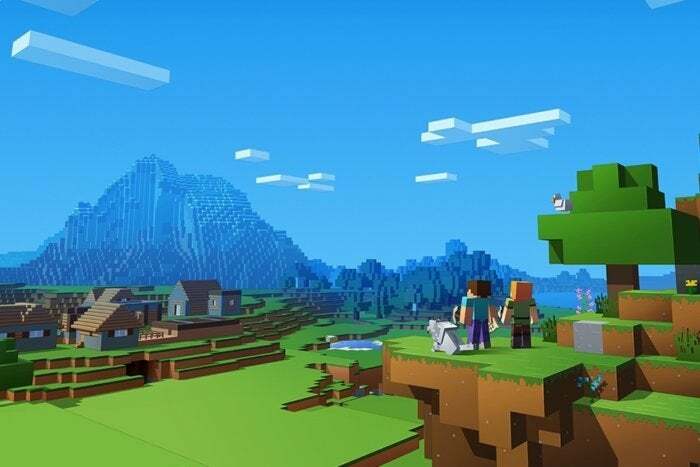 For those unfamiliar with Minecraft, it is a game that allows players to construct 3D worlds out of textured cubes, but players must explore and gather resources in order to do so. There are individual and collaborative multi-player modes. It was originally published in 2011 before being acquired by Microsoft in 2014. To date it has sold over 121 million copies making it second only to Tetris in terms of popularity. Microsoft has since developed Minecraft: Education Edition which is used in schools and has additional pedagogical tools and functionalities. Since many students are already familiar with the platform from playing the game at home, educators are able to draw upon the student’s own expertise and to focus on the learning aspects rather than covering the mechanics of the technology itself. It also prompts situations where “expert” users mentor younger learners and also help teachers who might not be as familiar with the platform as their students, further fostering a collaborative ethos in the classroom. Another advantage of Minecraft is that it helps to encourage a modular approach to building skillsets. When each new problem demands you to find and leverage different resources, materials and collaborations, you start to envisage those as pieces of a puzzle, for which there are multiple possible solutions. This is why LEGO and Minecraft have proven so popular and effective in those contexts, as their core design is in itself modular. A recently published survey polled teachers across 11 countries and four continents. It revealed that students’ decision-making and communication ability were positively impacted by the time they spent playing Minecraft, and that it cultivated a creative problem-solving mindset. In Minecraft, starting over represents a new opportunity rather than a regrettable ordeal. Remaining calm and focusing on solving a problem is a skill that is likely to serve students well throughout their academic and professional careers. Surveyed teachers reported that students using the platform were confident interacting freely during lessons, exercising agency often without prompts from teachers and overcoming challenges as teams. They found that working through the game made it easier to bridge accessibility issues, in that students with different learning styles and abilities were more easily able to find common ground, and to share what they discover in multiple formats. They also felt comfortable experimenting, and perceived failure as part of the creative learning process. This resilience and growth mindset is very much recognized as a key desirable trait by employers, especially in innovative industries such as technology. Paradoxically, however, the more teachers and students utilized the Minecraft platform to deliver pedagogical content and improve learning outcomes, the less emphasis they placed on the game itself. As is often the case with successful technology solutions, the measure of their success hinges on how invisible they become, allowing the content to shine through. Considering how videogaming is often perceived as being socially isolating, it is somewhat surprising that one of the areas that was most dramatically improved by engagement with the Minecraft for Education platform was social and emotional learning (SEL). A study conducted by Microsoft has shown that an increasing number of schools across the SEL, an approach that builds skills and competencies that help students be successful in school, work, and life. In the context of K–12 education, SEL is the process through which students acquire and effectively apply the knowledge, attitudes and skills necessary to understand and manage emotions, set and achieve positive goals, feel and show empathy for others, establish and maintain positive relationships, and make responsible decisions. SEL initiatives thrive when woven into subjects across the curriculum throughout the traditional school day, tackling real-world problems, or at the very least problems that “feel” real to students. Research has shown that students exposed to SEL are better equipped to manage themselves and exhibit agency over their own academic experience, have a greater understanding of the perspectives of others and a better ability to relate effectively to them, and are able to make sound choices about personal and social decisions. Social emotional learning comes to life when knowledge is applied to solving relevant problems, whether in the context of real-world scenarios or disguised as play. One of the best examples that Rami showed me was how students needed to leverage basic chemistry to obtain materials such as latex. This could in turn can be used to make balloons. And those balloons can be attached to the whimsical pigs that populate the game (once you manage to catch them, that is). I have a feeling that applying chemistry to make pigs fly is the sort of thing that might make a student remember what that chemical components of latex are far better than memorizing the periodic table ever could. I know the image of those floating square pigs stuck in my mind. Comprehensive SEL goals include developmental benchmarks across five key social and emotional competency domains, encompassing self-awareness, self-management, social awareness, relationship skills and responsible decision-making skills. Minecraft creates opportunities for transformational learning experiences, says Dr. Michelle Zimmerman, an educational researcher who works at Renton Prep Christian School, an institution which makes extensive use of the platform in delivering its curriculum. Educators have the opportunity to help students develop empathy through gaming and imagine how they’d like to be treated, talk through scenarios in gaming and in their personal lives, and discuss how they would do something differently (or have wanted to be treated differently), then practice those skills. Technology doesn’t impede our ability to build relationships; conversely, with regard to gaming in the classroom, it can serve to further bolster them. We know that human connection can be powerful in many settings and environments. Gaming is no exception, Zimmerman concludes. It’s somewhat ironic, Salcito says, that as the world becomes ever more digital, companies like Microsoft are more than ever in need of hiring people with interpersonal skills. As artificial intelligence transforms the labour market, the importance of human skills like creativity, interpersonal understanding, and empathy becomes exponentially more valuable. Therefore, those who can make connections and foster collaboration in globally distributed teams, who are capable of relating to, empathise with, and inspire their peers. And that valuing of so-called “soft skills” in the workplace is far from a trend that’s unique to Microsoft. Because more companies are demanding this, universities are also pivoting towards offering “mission based” degrees. In other words, you enrol in order to explore how to solve a problem rather than to “become” something. Stephane Cloatre, Minecraft Global Mentor who works in partnership with Microsoft, says that this flexibility also allows the platform to evolve and incorporate emerging technologies as they become more prevalent for students. Mixed Reality, which is a big focus for Microsoft’s own strategy, is a prime example of this. Rami adds that students and teachers ask all the time about when immersive functionality will be rolled out on the platform, but for Cloatre, the pieces are in place for that to happen, since Minecraft is pretty much a 3D design platform already. It is easy to see how that could actually become quite an exciting avenue in future, as immersive tech becomes pervasive it will require lot of fresh talent and skilled professionals to develop the ecosystem to its full potential. Yet none of this, Salcito stresses, can happen without proactive educators leveraging the platform to appropriately support learning outcomes for students. “Educators are champions, without them we can’t do this,” he concludes. I am lucky enough to have some amazing friends, colleagues, and mentors who are doing interesting work around use of podcasts for sparking a conversation around various topics in education. There is a podcast from team SLA – Zach Chase and Amal Giknis are doing their thing here in collaboration with ISTE. Ever wondered what it would be like to launch your own school? School leaders and educators are tackling that very question in the Microsoft Flagship School Podcast series. My friend and Lady Gaga of Education, Nick Provenzano and I recently connected via his podcast and discussed the role of Creativity in Education. Let me know your thoughts on it if you take a listen. What podcasts are inspiring you as of late? What are your podcast recommendations?